The following is a response to Monday's post "of course burtonsville's settling" from Eric Luedtke, schoolteacher and member of the East County Citizens Advisory Board. He argues that it's time to stop casting blame and find a way to save Burtonsville's dying village center. As I am guilty of some name-calling myself, I appreciate his call to move forward. 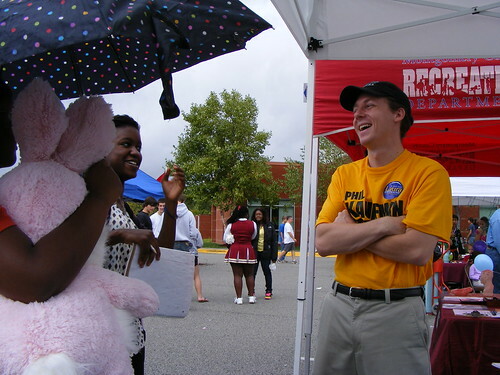 Luedtke at last year's Burtonsville Day. Burtonsville needs help. That’s the one thing that pretty much everyone in the east county can agree on. Our central business district consists of row upon row of aging, decrepit strip malls. One of our two biggest shopping centers has something like eight empty storefronts, and is about to lose its anchor store. Much of the office space is empty. Property values are stagnating. I’m glad Dan weighed in with his opinion about economic development in Burtonsville; it’s a debate that needs to happen and both the media and the county’s political establishment have been paying too little attention. But we need start the discussion from a constructive place, and too often those who have engaged in this conversation over the last few years have simply been re-enacting past debates and trying to find ways to place blame. It’s the NIMBY’s. It’s the developers. We could have done better. We could have had a real CBD, a walkable community, if only those guys over there hadn’t screwed everything up. 1. One Vocal Councilmember is Not Enough: Nancy Navarro, like both of the Praisners before her, is proving to be vocal in her advocacy for the Burtonsville area. But if the last few years have shown us anything, it’s that one voice is not enough. We need the politicians to fight for us, and because politicians are what they are, the only way they’ll do that is if we make them. People downcounty do that very effectively, which is why so many of our elected leaders seem to think the county starts at the DC line and ends at Randolph Road. The Burtonsville community needs to be more vocal, and unfortunately we don’t have an institution to do that. No city council like Rockville. No chamber of commerce like Germantown. No civic umbrella like GOCA in Olney. The closest thing we have, the East County Citizens Advisory Board, is hamstrung by county rules. Unless and until we have a real organizational advocate that can make more politicians listen, even those who live here will have no real reason not to ignore us. 2. It’s Time to Reopen the Master Plan: The Fairland Master Plan is simply not meeting the needs of the community. Master Plans are meant to give an overall vision to the development of a community. Our current master plan, regardless of how one felt about it in 1997, has been so diluted with ZTAs and special exceptions, so undercut by economic realities, that there is little left of any cohesive vision. The only thing preventing this is the budget reality that planning takes money, and the powers that be have a specific order to go in. I find that, frankly, a little ridiculous. I have a friend who’s an ER nurse. When two patients come in, one with a heart attack, one with a broken thumb, she isn’t rushing to the side of the guy with a broken thumb. For planners to ignore the need for a Fairland rewrite while working on plans for parts of the county which are already economically successful is ridiculous. 3. We Need to Start From Scratch: And I mean from scratch. Start from a blank slate, and a single question: What do we want Burtonsville to look like in twenty years? That allows us to look at all sorts of options. Slowing traffic through the CBD. Redeveloping the entire shopping center that the Giant is leaving, since its economic viability is questionable anyway. Working out a deal with the property owners west of Seibel’s to try to get something better out of that stretch of road than strip malls. History is important – and I’m a history teacher so you know I really believe that. But if we let the debate about our future to continue being dominated by debates long past, we will accomplish nothing. 4. It’s Time to Stop Attacking Each Other: There’s nothing to be gained from calling each other names in the paper. It might help the Gazette’s circulation some, but it does absolutely nothing for our community. No matter how hard it may be sometimes, the key to effectively solving our problems is this: assume that the person on the other side of the table is acting in good faith. If you've got something to say about East County, say it here! Leave a comment or send your thoughts to justupthepike at gmail dot com.